I almost always blog about Vermont Yankee, but today I am taking a break from nuclear and its issues. Today is about coal. This afternoon was the culmination of the coal course I gave. We finished the class work last week, and today we visited Public Service of New Hampshire Merrimack Station, near Bow, New Hampshire. It was a beautiful winter day, and the PSNH people were great. The huge scrubber construction project means parking space at the plant is at a premium, so we left our cars at the Park and Ride and PSNH picked us up in two vans. PSNH was very well set up for the tour. Within the plant, we wore ear protection. Next to points of interest, PSNH had a diagram set up on an easel. The guide would point to parts of the diagram and then to parts of the plant. It was very easy to understand what we were seeing. I have taken tours of nuclear plants, and never seen anything so thoughtful, cheap and effective. The plant was gritty compared to a nuclear plant, but not nearly as dirty as I expected it to be. The plant was surprisingly clean, actually. The plant has two cyclone fired boilers. I didn't know that these types of boilers are designed to make very little fly ash, and lots of molten slag. The plant doesn't need ash ponds, but instead has relatively small ash hoppers. The slag was beautiful. I loved looking through a port to see streamers of molten slag flow into the quenching water. Strands and streamers of dark glassy material and lighter glassy material, flowed into water, backed by an orange glow. All the slag is ground coarsely and sold as roofing material. The small amount of ash is sold as an additive for concrete. It's nice to see a coal plant so well run, with all the byproducts made into something useful. We also looked though welders glasses into a port at the fire box. I didn't enjoy that as much, perhaps because I had seen similar things back-in-the-day when I worked on NOx control at Acurex (now part of A D Little consulting). We saw the anhydrous ammonia tanks for Selective Catalytic Reduction (SCR) of NOx. Merrimack was one of the first plants to use SCR. We also saw the huge sulfur-and-mercury scrubber under construction. The cost of the scrubber is close to $500 million dollars, and building it has been very controversial. On the other hand, the influential Granite Geek blog just posted that the scrubber looks like a good choice in the current political climate. One thing I had not realized was that this boiler was designed in the 60s for a certain type of coal. That's the kind of coal it can burn. 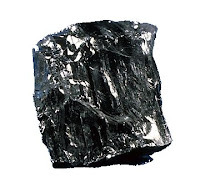 They can buy this type of coal from three places in Appalachia, or from Venezuela or Europe. They buy from Appalachia and Venezuela. They have to check every train to understand the properties of the coal, and they do a fair amount of coal blending. The idea that we import coal from Venezuela to New Hampshire was strange to me, and PSNH tries to avoid importing coal. But boilers are designed for coal of a certain level of heat content, ash content, sulfur content, water content. They can get this type of coal from only certain places. I was very impressed with the plant and the courtesy and professionalism of the people who work there. I was also impressed with being able to walk right in to the control room and stand around. They told us: don't push any buttons, they all work! But we were allowed in. Again, different from a nuke plant. I also will take a small amount of credit for the success of the trip. My course introduced people to basic coal and pollution control technology, so everyone was able to understand what they were seeing. We all had a good time. I include my course plan here. I leave out the names of my guest speakers, since I haven't asked them if they wanted to be on my blog. • Guest presentation: Advanced control methods: Cleaner Power Without Scrubbing. Participant reports cover historical topics (the history of regulation or an incident or technology). Each report is ten minutes long, with five minutes for questions. Participants do not need a technical background in order to prepare a report. We will discuss other possible reports during the first class session. Although off topic a bit, I have been following off and on the reporting of the VT issue on WCAX ch. 3, which we get up here in Montreal. I have to admit that I have not been that impressed with what I have see so far. Do you know if they make any attempt to get he opinions of those that support the plant other than Entergy mouthpieces? Maybe you should get a letter writing campaign going to get the coverage balanced a bit better. I tried at one point to get a letter writing campaign going. I am going to whine a bit. The letter writing campaign wasn't easy to set up, and I decided to blog instead. Now, Entergy does not pay me and I would not want Entergy to pay me while I am blogging about them. BUT. They could do more to help the plant. For example, there's Town Meeting day coming up and a friend of mine has been asking Entergy for info to take to his town meeting, which will vote on a shut-down VY petition. So now my friend is asking me. You see what I mean. I have asked Entergy again, but I think I will simply be writing bullet points for my friend and myself this weekend. Town meeting is big around here. Entergy could have fliers, talking points, etc. available. There's just one of me, and I can only do so much. Also, i think that we pro-nukes just don't have much fun. Where are our potlucks, our rallies, our letter-writing-at-my-house evenings, our local chapters? There ARE pro-nukes out there, and they have nobody to talk to. I remember that writing letters for Amnesty used to be great fun in terms of support and meetings and so forth. Whine whine. Now all the anti-nukes hate me, and Entergy will probably hate me too. Oh well. My kids like me. I think. It's can't be easy being the lone voice in a fight like this, I feel for you. But even if the plant is closed, you will be able to look at yourself in the mirror after, and you will also know too that time will prove you right. As for Entergy, I see that they made a point of telling their shareholders that the closure of VT would have little impact on the company's bottom line. Now to some extent this could just be sandbagging, to keep their stock from being dumped by nervous investors, but as you say corporate support has been slim. I am beginning to wonder if Entergy is starting to see VT as a millstone around their necks, and would be just as happy to see it go, rather than fight Vermont residents forever on the matter. I'm not the lone voice. There are others. I didn't mean to imply I was all by myself, but I I don't have a fraction of the resources I would like to have. By "resources", I mean I don't have fliers, bullet points, events planned to garner publicity, etc. All the stuff that makes a campaign work! Your comments about Entergy's commitment to the plant may well prove to be true. I persevere because I think closing this plant would be a shame for the nuclear industry, and put Vermont in a hard place about buying power. Thanks for the informative post on a coal plant. The reason for pro-nuclear activist to be objective about coal is that it is an important part of energy mix. If you look at the cost of keeping an older plant running by adding pollution additional controls, keeping VY looks very good. Thank you, Kit! Here's a coal plant, over 40 years old (built 1968) and people are okay with investing almost half a billion into pollution control. While people yell and scream about Vermont Yankee as too old be be worth fixing up. It bothers me. It doesn't bother me that they are fixing up Merrimack, but it does bother me that they won't use the same standards for VY. Both are important parts of the energy mix. Also, thank you for liking my post about the coal plant. When I started blogging six weeks ago, I feared that nobody would read my blog if I ever strayed off-topic. I'm still a little worried about that, and a note like your note helps a lot. Thanks! Meredith I am always looking to looking for systematic approaches to producing electricity with less environmental impact. Let me remind you that the standard for nuclear and coal are the same. We are charged with making electricity safely with insignificant environmental impact in the general context of how we live. While there is no such things as a zero risk, the North American electric generating industry of keeping it very small and smaller every year. One of the reason we are building new nukes is the price of coal on the world market. A second reason is the cost of reducing risk. For example. putting a stainless liner on a spent fuel pool to prevent tritium leakage into ground water add cost but when amortized over the the life of the plant. However, the cost of ash ponds are something else too. The people who yell ands scream to close nuke plants not have standards but drama. I worked at Rancho Seco when it closed. It is painful. I think VY has a better chance because of its great recored. Kit. I remember Rancho Seco. I visited there once, back in the old days, shortly after I left EPRI. Late 80s early 90s? That was a very sad story. I also think it was a story about a municipal utility trying to run a nuclear plant without much in-house expertise as backup. Nuke plants do better when owned as a group. When I look at the hills around Vermont, covered with trees, I thank coal. Without fossil fuels, these forests would all be gone for firewood. You understand, I think coal should be phased out and nuclear plants built, but I also think people might learn to appreciate the work that has gone into cleaning up coal. A lot of smart people have spent a lot of time and money to give us the relatively clean coal plants we have today. Marry, thank you for visiting and for the compliment! Its nice to see someone write about Merrimack Station, with respect to what the station does to burn a "dirty" fuel as clean as they can. I work at this station from time to time sub-contracted during annual outages. A lot of people see the 'born on date' and they think "why are we spending so much money fixing an old plant". Power plants are not like a car that you drive 150K miles and then junk it, at least not the plants of those days. This plant has had a lot of updating, and a lot of repairs over the years and not much of this plant is original. I'm glad you did notice that for a coal plant it was cleaner than expected, I've worked at many that were far worse. As far as Vermont Yankee goes, I would love to see them spend the time and money to keep that station going. I have immense respect for the careful job they do at Merrimack Station. Also, I know many people who have dedicated a major portion of their lives to improving the ability to burn coal cleanly...designing better scrubbers, pollution control, etc. I greatly prefer nuclear energy, but I try to avoid demonizing coal. And if I don't avoid it, Kit P will correct me! Here's his guest post at this blog.